The whale shark is one of my favourite animals. 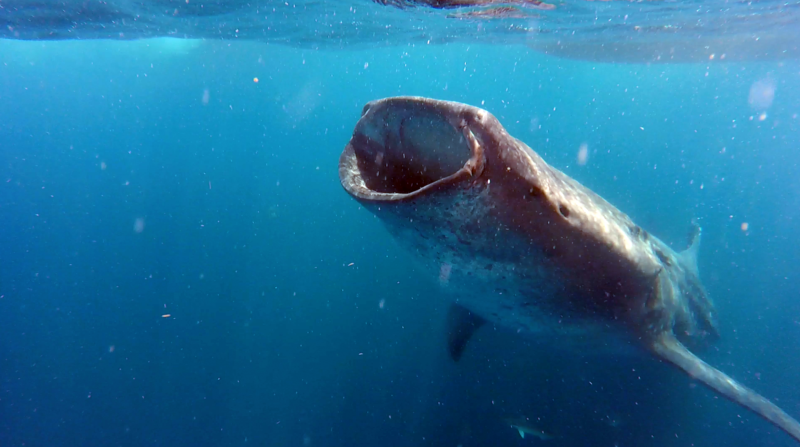 Whale sharks are mysterious, majestic, and downright adorable. Look at their smiley faces! They’ve got polka dots! What’s not to like? They’re also endangered, misunderstood and often mistreated. Keep reading for how to swim with them in a responsible way! 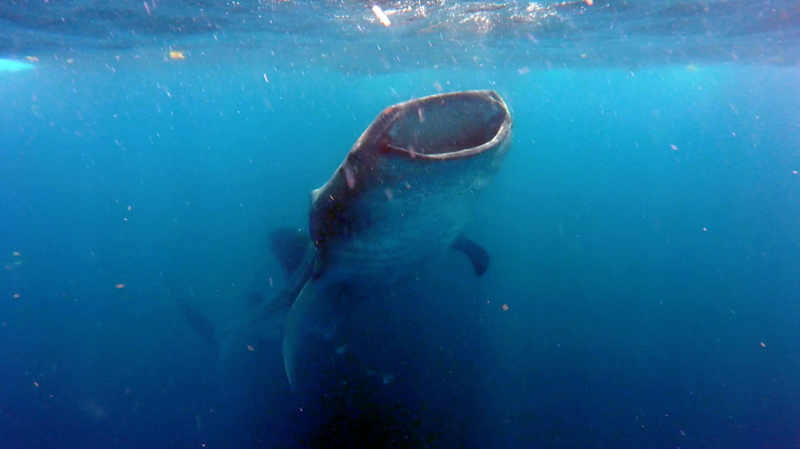 Whale sharks congregate off the coast of the Yucatan every summer from July – September, and as I was visiting Mexico I decided I’d quite like to try see one or two. This might sound tentative for someone who claims whale sharks are one of their favourite animals (a fact my friends, family and colleagues will attest to – I talk about them a surprising amount, given how hard you’d think it would be to work them into conversation in day-to-day adult life). Because I care about whale sharks, I’ve been hyper aware of the ignorant and damaging treatment they’ve been facing due to tourism around the globe. Recently, footage emerged of divers ‘riding’ the whale sharks, and I’ve seen videos of tons of boats crowding around one shark, whilst snorkellers fight each other to get close and touch the shark, diving underneath and causing distress. While in Malaysia, I went on a day snorkel trip from the Perhentians – which was a great experience, until we got to ‘turtle bay,’ where it was apparent there was a single, tagged turtle that boats crowded around and snorkellers literally hit each other (I got a foot to the face) to get close. One guy swam down on top of the turtle, planting his hands either side so the turtle couldn’t move. 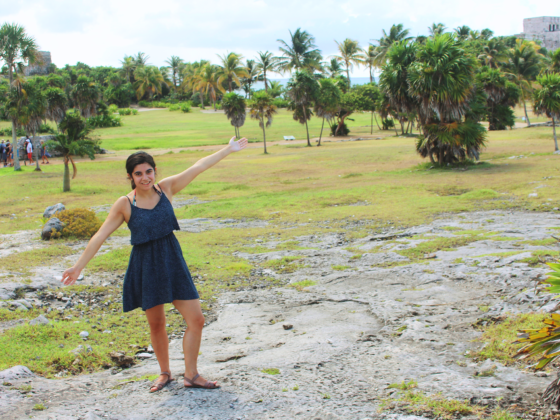 It was a really distressing experience for me – I can’t even imagine how the turtle felt. With this in mind, if I was going to swim with whale sharks I had to be happy that the operator I was going with was ethical and cared about them just as much as I do. 4) the boats must stay a set distance away from the shark. Also, 5) use biodegradable sunscreen (which I’m already on board with thanks to my ever-growing obsession with scuba diving). 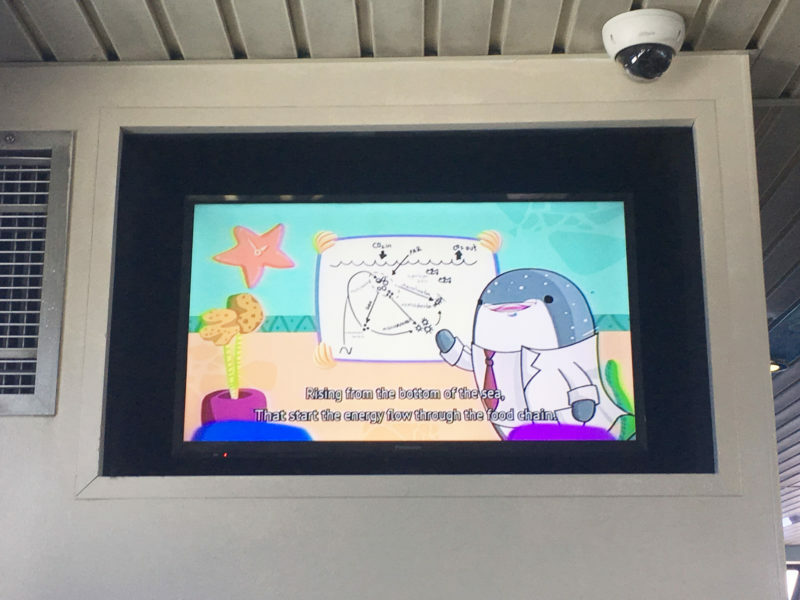 Side note: when on the way to Cozumel, I actually saw a video from I guess the Mexican Tourist Board on why we should care about whale sharks and how they should be treated, which was so good. 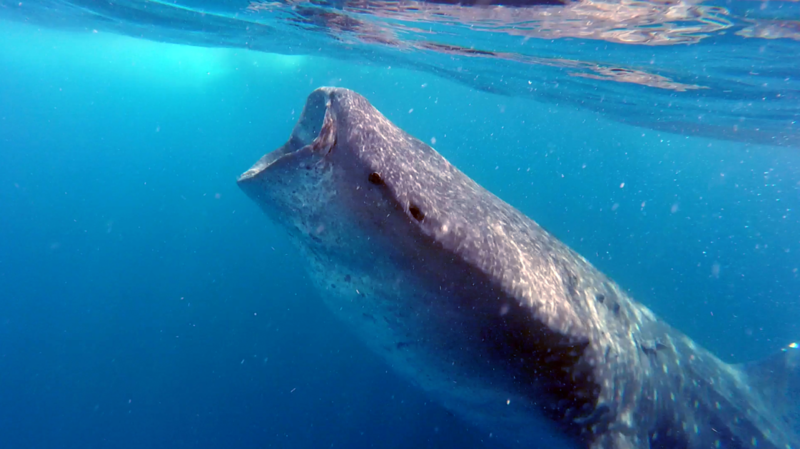 It featured an extroverted scientist whale shark called Mr. Tibu and I loved it. 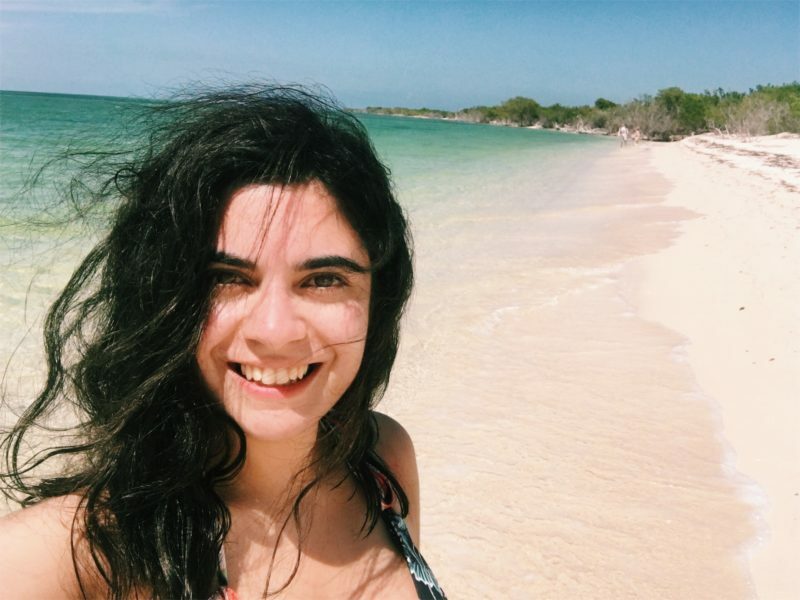 So, when we got to Holbox, I was on the look out for an operator with a trusted reputation that actually gave a damn about the sharks themselves, rather than just their bottom line. When you walk around (the gorgeous) centre square of Holbox, you’ll see tons of tiny wooden stalls advertising whale shark tours. Personally, I wasn’t hugely comfortable just walking up to a wooden stall in terms of assuring that the tour would be ethical and responsible. 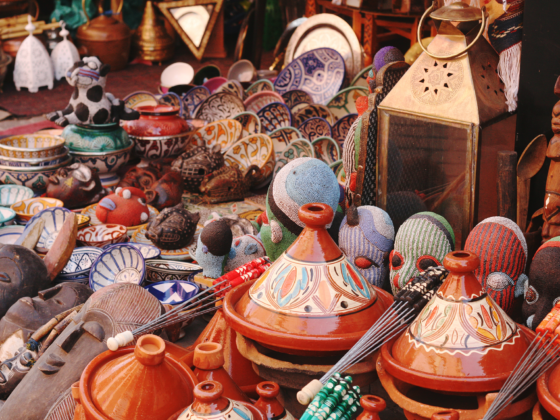 I checked in with my hotel, Casa Blat Ha, who recommended two companies. If I’m honest, I can’t remember the first one (I was super jet-lagged and keen to get out to the gorgeous beaches), because the very kind guy behind the desk had a huge conversation with me about whale sharks, and he said that the tour company that everyone wanted to go for and had hands-down the best reputation when it comes to actually respecting the sharks was VIP Holbox. VIP Holbox offer a number of services, including transfers to and from the island. I chose to go on the whale shark tour. It cost $130USD for a full-day tour, starting at around 7AM – which is a lot of money, I know, but I was willing to pay extra to make sure I wasn’t going with an operator that mistreated the sharks or let its patrons get away with breaking the rules. They explain on their website that they are passionate about maintaining responsible and respectful encounters with flora and fauna. They engage with scientific research and try to ensure that the impact of any trips they run on the environment are ‘imperceptible’. So as I said, the day starts at around 7AM. We were picked up outside our hotel at 6:50 (in one of the golf-carts which are the only form of motorised transport you’ll see on Holbox) and taken to a cafe – not the VIP Holbox offices (which you’ll see near the downtown square area) – for a lovely breakfast of pastries, fruit and coffee, which was much needed. There, we met our guide for the day, Gustavo, who was absolutely fantastic. Charming, passionate and super friendly – I can’t recommend him enough! He and I had a huge conversation about his passion for the whale sharks and how important they are to him. He said even though he sees them every day, every time he does it’s like the first time he saw them. 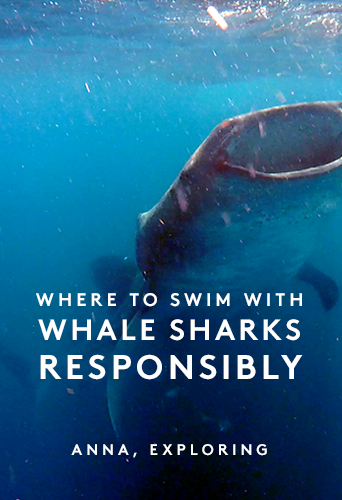 It’s important to make sure your guide has been trained in responsible tourism and encounters with the whale sharks. 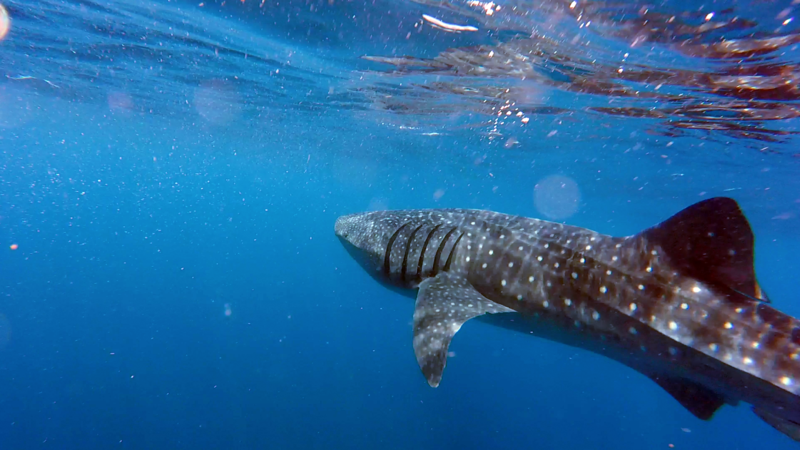 It was clear to us that Gus really knew his stuff; he took us through a briefing with information about the whale sharks, how the day would work and most importantly, how we could encounter them in an ethical and responsible way – highlighting the rules I listed earlier. He was calm, confident and kind – pointing out that if the shark touched you, he wouldn’t be mad (you can’t help it if a 10m whale shark decides you’re where it’s next move is going to be) – but there’s a zero-tolerance policy for actively touching the sharks, diving underneath them or spending too long in the water. VIP Holbox also provided us with biodegradable sunscreen, just in case you didn’t have your own, which I thought was a great touch, as a lot of people aren’t aware of the damage regular sunscreen does to the ocean – and it’s also really hard to find reef-safe sunscreen with a high SPF! This year, the whale sharks decided to pick a slightly different location for their four-month lunch – which is of course their prerogative! This meant that we were about 2 and a half hours in the boat. 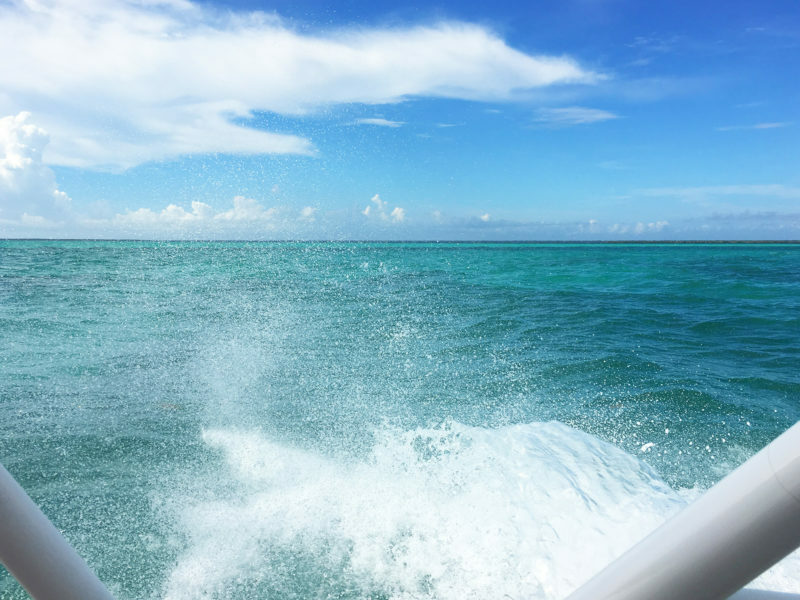 It’s quite small and was a somewhat bumpy ride depending on where in the boat you sit – I sat right in the middle for the way out, which was fine for me, but I only tend to get seasick in boats that aren’t moving (because I have to be different and mildly irritating, haha!). Those sitting towards the front of the boat on the side got quite wet and fairly seasick. VIP Holbox offered seasickness pills before we set off, so if you’re even slightly concerned I’d recommend taking them. The ride out is really gorgeous, if you like boat rides (and if you don’t, you should re-evaluate – a good boat ride is a lovely experience!). The sea was a crazy turquoise for nearly the whole trip. In August/September, the temperates reach around 32-34ºC, so the gorgeous warmth and beautiful sea was very soothing. I have to admit, when we got close to where the whale sharks were feeding, and I realised that the lumps on the horizon weren’t land, but were a huge mass of boats, my heart sank. There were about thirty boats floating together, and I was really concerned that the sheer number of boats would be very stressful to the sharks. There was a part of me that was reconsidering getting in the water. 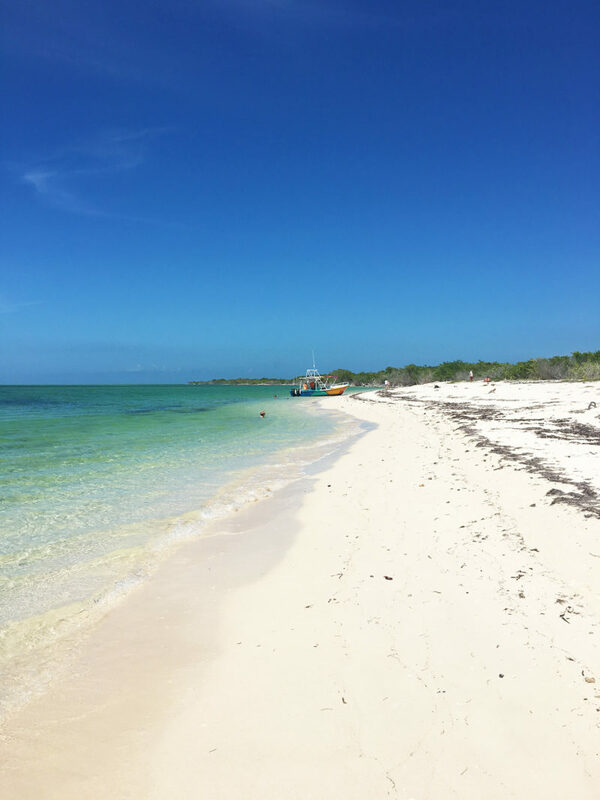 VIP Holbox was fantastic – they stayed away from the mass of boats until they spotted a shark that wasn’t surrounded, trying to make sure that no one shark was bombarded with people. As mentioned earlier, only three people should be in the water with any one shark at a time. I was up first, with a really lovely British girl and Gus, who was the third person in the water with everyone – to make sure we weren’t upsetting the shark and to keep an eye on us. I ended up going in first. You’re provided with the snorkel and mask, and if you want them, flippers. You’re sat on the side of the boat and when Gus told us, we jumped off. The first time I got in the water, I was not prepared. 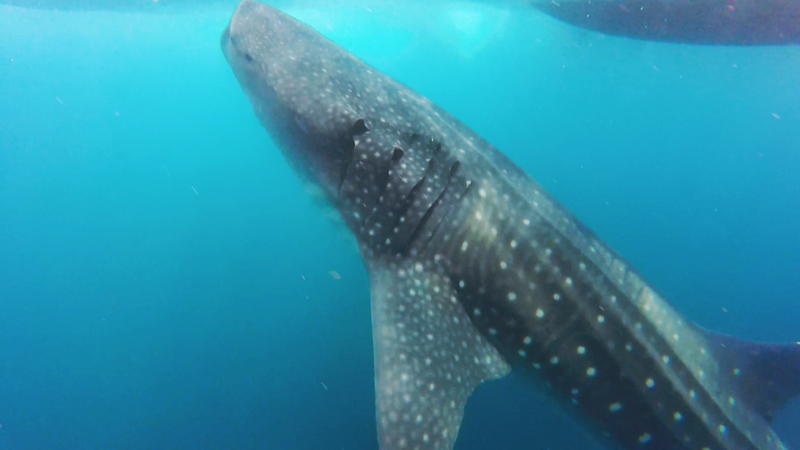 Didn’t have my GoPro on, was still a bit concerned about all the boats – but Gus grabbed me and pointed me in the direction of the shark – and there, right in front of me – a whale shark! You can see the remora on his underside! The first one was a little smaller than I’d imagined – perhaps 5 metres long, not that that is small by any stretch of the imagination! We were in the water with the shark for about two minutes – whilst this shark didn’t seem bothered by our presence at all, he also wasn’t too interested in sticking around, and slowly swam off to find some more food elsewhere. You can see from the shots that the water was filled with the tiny plankton the sharks are gorging on – some even got stuck in my hair! This is partly why the photography in this post isn’t incredible – the water was filled with food and debris, and also, as we were only with the sharks for a few moments at a time, I focused on capturing footage with my GoPro rather than photographs, so these are stills from the video I took. Look at his huge tail! I got in the water prepared with my GoPro already on this time. The sharks were huge, I couldn’t get them all in one shot, I had to keep panning up and down. They were far more concerned with eating than with me being in the water with them – at one point, one got so close to me I desperately started swimming backwards to make sure I wasn’t going to get in his way! About thirty seconds into the water, Gus spun me around to point out a huge manta ray that swam straight past my head. 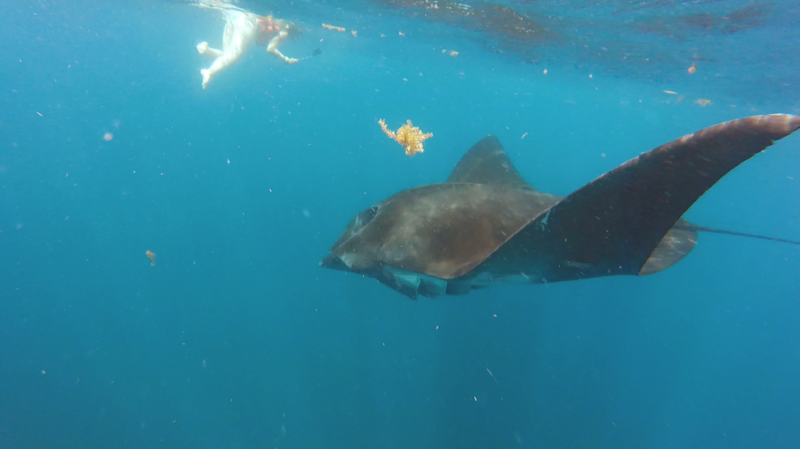 I was so thrilled by this – manta rays are stunning and I had no idea they would be there too. 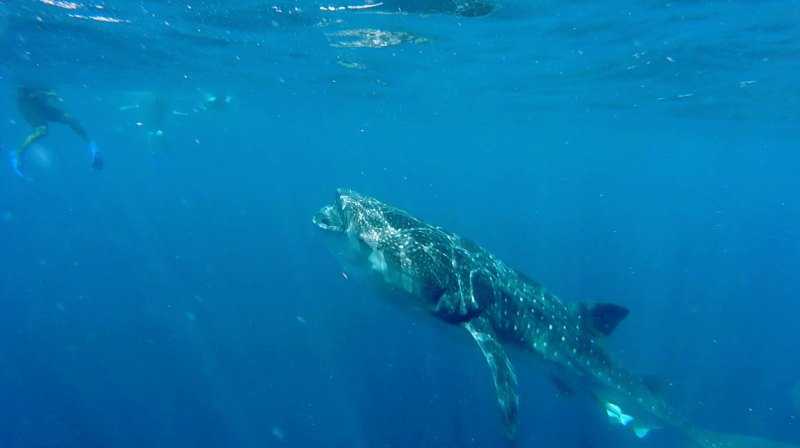 Whale sharks and mantas in one encounter! I’m sorry the quality of this is dire; you’ll have to keep an eye out for the vlog! Looking back at the footage when I got home – we were surrounded by mantas, but I was so bowled over by how close and how gentle the whale sharks were, I didn’t even see them. I remember just being transfixed by the sharks, how calming and peaceful they were. The one closest to me was so huge; I kept trying to get him all in one shot but it was almost impossible. Look how close he came! 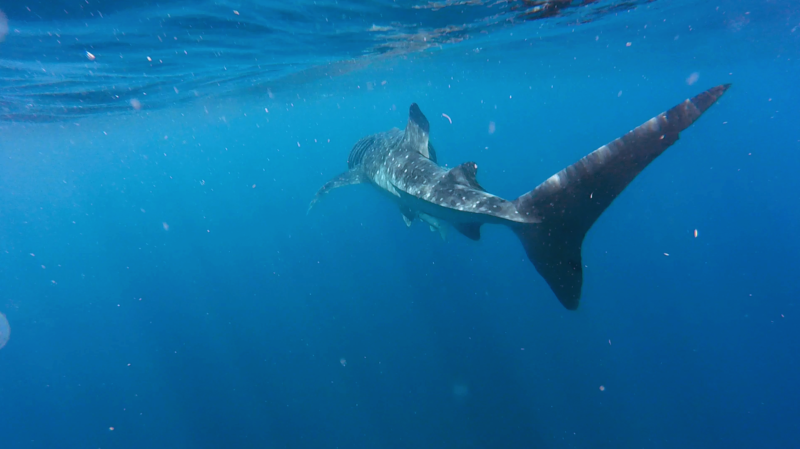 I was so spellbound by the sharks that I realised after about a minute that I was on my own in the water – Gus and my partner had begun the swim back to the boat! 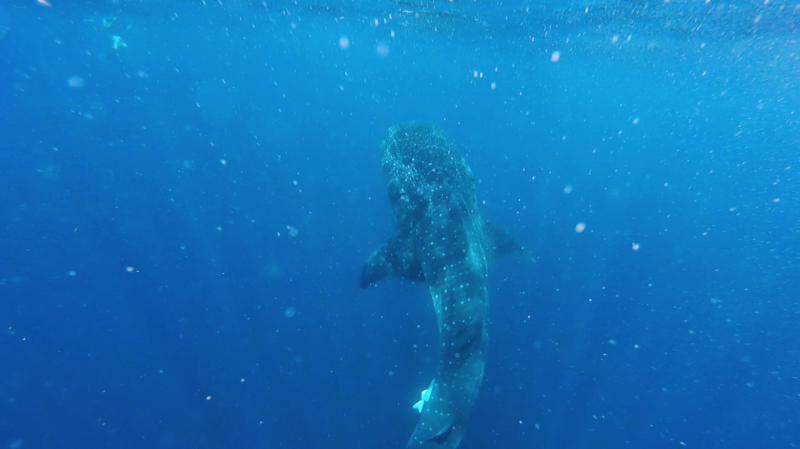 I quickly swam off, but not before one last look at how majestic a creature the whale shark is. While we were waiting on the boat for other people to complete their rotations, we were able to see the whale sharks from the boat. This was amazing, as you can really get a sense of the size of the sharks. This also meant we were able to watch the behaviour of the other boats, and this really affirmed my decision to go with VIP Holbox. I could see other boats crowding far too close to a single shark, jostling for space. They didn’t seem to care how many people were in the water – or how long they spent with the shark. I saw people diving down underneath the shark and not being rebuked. Next up, we travelled to a snorkelling spot in the middle of the ocean that was crazy shallow. There was a lot of fire coral and tons of tropical fish – and at one point, a HUGE ray swam underneath me that was at least a metre across! After snorkelling for about twenty minutes, we travelled to a completely deserted strip of paradise. We had this strip of beach all to ourselves. The water was a crystal jade, the sand felt like velvet, and the sky was a perfect blue. The water was so warm; the whole experience was absolutely surreal. I didn’t think that places like this existed outside of airbrushed and somewhat-unrealistic YouTube videos. I did hugely sunburn myself here, which I wasn’t aware of at the time – it didn’t hurt at all, but then over the next few days my lip exploded into sun-blisters which was not fun. So wear even more sunscreen than you think you should, folks! We then had home-made ceviche on the boat (along with some sandwiches) that Gus made as we travelled, which was fab. There was also guacamole but I’m allergic to avocado so I didn’t try that (this was a theme throughout my trip to Mexico). On the way back, we stopped to see flamingoes which was really cool. The colours, again, were crazy. And after that, we headed home. 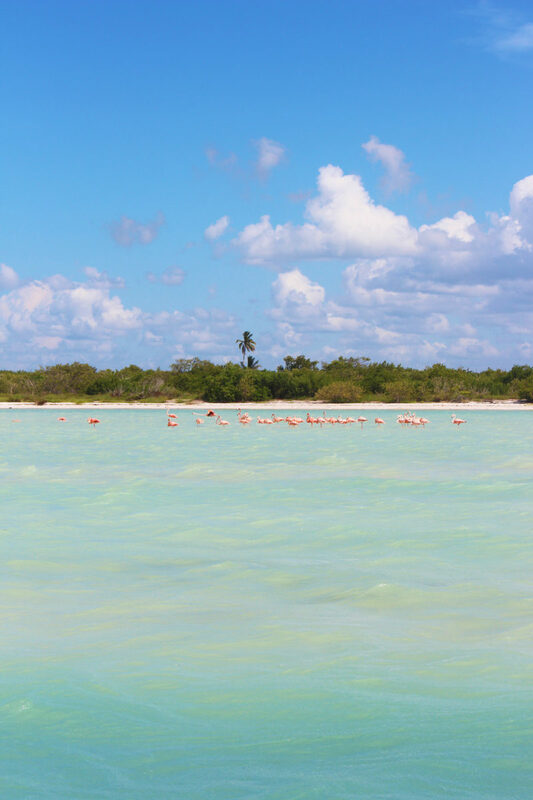 We got back at about 3:45PM – we would have spent a bit longer with the flamingoes – but I had to dash to get the ferry on to Merida! Overall, the experience left me a little conflicted. I adore whale sharks and I am over the moon that I was able to see them in the wild. It was even more exciting and moving than I could have ever imagined. However, as they become ‘instagram stars’, more and more people are trying to swim with them without caring about their wellbeing or even being interested in them generally. 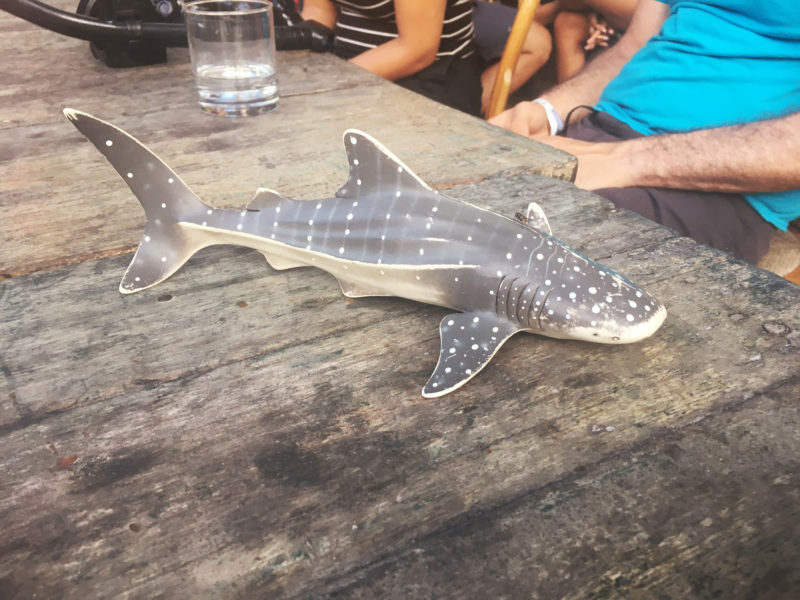 I’m not trying to make everyone into a crazy whale shark nut like I am – but it does concern me that I’m essentially feeding into a trend in tourism that, at the moment, is poised on a knife edge between responsible and irresponsible. The rise of the internet and apps like Instagram mean that it’s easier and more visible than ever to see and engage with animals around the world – which can be good and bad. It’s really good that there has been a larger, much more positive trend in eco-tourism and responsible tourism in particular when it comes to animals. The backlash and strong growth in elephant encounters that don’t include riding them is a good example. The way I see it is that if these encounters are going to happen, it’s important to support them by promoting the best, most responsible and most ethical operators out there. 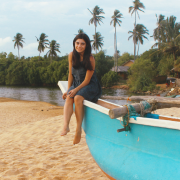 It’s important to educate people about the benefits of responsible tourism – as the Mexican tourist board are doing with their adorable infomercials. 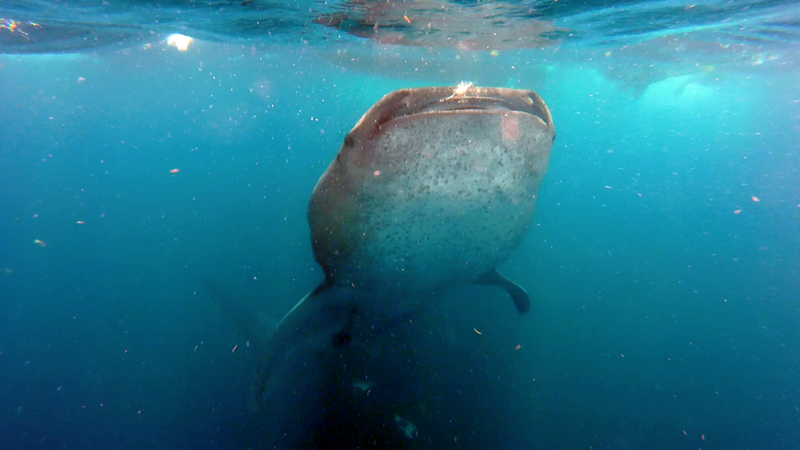 And it’s important to report back on positive encounters with whale sharks, so more people want to learn about them and want to keep them safe. The poor pangolin is an example of an animal that barely anyone knows about and is critically endangered. These animals that are in danger are in need of some positive PR! Be prepared to pay a bit more to make sure the sharks are being respected and be prepared to be patient! Have you swum with whale sharks? How was your experience?